So, there's an article in today's New York Times about fake Iraqi villages in the Mojave desert, used by the military to train soldiers for future service. Makes sense. It is a marriage of military technology and Hollywood fakery; some 350 Arabic-speaking Iraqi-Americans and plainclothes Nevada National Guardsman live here almost year-round to offer American trainees what one officer described as "a vortex of chaos." The insurgents even get acting lessons, coached by Carl Weathers, best known for his portrayal of the boxer Apollo Creed in the "Rocky" films. One of the big changes I'll face in moving from the US to Canada is, obviously, the radically different health care system. I found it sort of interesting that even when I was up there for my interview, several people specifically commented on that change, and assured me that in Toronto, at least, there are enough doctors and specialists that the legendary wait times are actually quite short. Considering how long it takes me to get an appointment with my doctor (who, I should say, I really like and will be sorry to leave), or the length of time it has taken to get appointments with a specialist the couple of times I've had to do that, I figure it can't be that different. But there are big differences, anyway. My friend B sent me a link to this article, on the differences. If I'm willing to agree with the whole gender difference thing (though I'm not sure I am, totally; I certainly don't visit my doctor all that often, and am probably just as likely to avoid the doctor as not), I suppose it's a good shift for me. At least according to these guys. But, you know, I had a thought the other day about health care in the US. I was listening to Marketplace on NPR. The host, Kai Ryssdal, interviewed the CEO of GM about his ideas for turning around the company, now in a bad place. The CEO mentioned, at one point, that one issue his company has to face that competitors (and I assume here he means foreign competitors) don't is health care costs for employees. And that got me to wondering why American businesses aren't clamoring for a national health care plan. You'd sort of think they'd be happy to get rid of having to deal with it all, with having to have big benefits departments and all that. Especially with growing international competition, often from places with national health care systems. So, why? Or are they? Yesterday I was wondering about the chronology of events leading to the current cartoon/comic uproar. And today, the New York Times had more detail in an article and in another timeline. So, some questions answered. Others remain. No, not knitting. I'm trying to finish things, but that's going slowly, so there's been little to report in the way of knitting. A longer clapotis. The beginnings of the second sock. Attempts to sew together the pinwheel sweater that keep frustrating me (to the point that I think I'm going to block the pieces first, which I wasn't originally going to do). Instead, the cartoon rows. I'm confused, a bit. First, this article from the BBC is the best description of what the actual cartoons are, without really showing them. That's useful. But this timeline leaves me confused. The cartoons were first published in late September. It took almost a month for the first comment, and then another couple of months for all this unrest to break out. I have yet to find an explanation for the time lag. Anyone? Bueller? "At last, we can stop dreaming and start digging," Gov. Mitch Daniels said. Mr. Daniels, a Republican, has hailed the transaction as "the Louisiana Purchase of our time for Indiana." With four days to go to get Major Moves on the political road to reality, Governor Mitch Daniels framed the debate this way. "I have come to think of this as the Louisiana Purchase of our time. If that's the case then we are the Indians." With just four days to go to get major moves on the political road to reality, Governor Daniels is stating, "I have come to think of this as the Louisiana Purchase of our time." Rep. B. Pat Bauer House Minority Leader of South Bend stated, "If that's the case then we are the Indians." OK. First, the second version makes no sense whatsoever. I cannot imagine anyone promoting a plan suggesting that it will bring all the advantages to a group of people that European expansion did to the Indians. That "news source" must have conflated the comments noted in the third report. But then there's the very question of analogy. Daniels suggests that this deal is like the Louisiana purchase. And thinks that's a good thing. I'm just not sure if he realizes that in making that comparison, the state of Indiana is Napoleonic France, about to squander the money it gains in fruitless and destructive war. And the Australian-Spanish company is the US. And I'm quite interested in the other bit of analogy, which seems to me more interesting. I'm assuming Bauer is speaking for Indianans... and that's kind of right. The residents of an area affected by the deal making of others. Except for that whole YOU VOTED FOR HIM thing, which makes it all ridiculous. Wandering the web over coffee this morning, I happened upon this note about a point GWB's apparently going to make in his state of the union address tonight. Basically, that America needs to worry because we may start lagging (or are lagging) in science and technology. Now, aside from the oddities of this president making that claim, which Chris Mooney, the blogger (who's admittedly and totally partisan, I should perhaps note), makes, this struck me because of a historical parallel I've been pondering for the past day. Basically, I've been thinking about how to go about dividing all of Russian history into two sections (semesters/terms). Bear with me, here. Different people do that dividing in different ways. When I first got my job, the course catalog had two regular classes on Russian history: Imperial Russia, which ran from the beginning of time until 1917, and the Soviet Union. That was fairly normal. I divided the first class into two, divided by Peter the Great. Also fairly normal. Since the fall of the Soviet Union (which is frickin' almost 15 years ago), there've been movements to integrate its history more fully into the broader history of Russia. That has often meant using earlier dividing points for a two semester sequence (that is, not privileging the Soviet Union by giving it a whole semester to itself). Most often, the new dividing point between semesters is 1855 (or 1861). 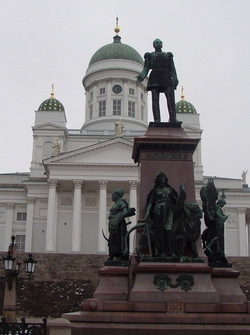 The former brought a new tsar to Russia, Alexander II (that's him in Helsinki on the left). The latter brought the first of his "Great Reforms," the emancipation of the serfs. The Great Reforms brought a whole series of other, uh, reforms to Russia; to the army, to the judicial system, to provincial organization and self government, to censorship, to towns... and the new tendency to use them as a dividing point emphasizes their significance. I've been wondering whether I'd want to use them as a dividing point, however. There's been a lot of work showing the ways that efforts in the decades before the Great Reforms really paved the way for them. In other words, they're much more integrated with the time that precedes them than this division suggests. But what other date to use? Another possibility would be 1812 (or probably 1815). Using the Great Reforms really emphasizes Russia's internal politics. Using this time, the end of the Napoleonic wars, would emphasize Russia's place in the world. The Napoleonic period sees the peak of Russia's international power, in many ways. For all the claims that Napoleon was beaten by the cold, not by the Russians (and certainly there's truth to the idea that poor provisioning beat Napoleon), Russia's military did extraordinarily well during the eighteenth century (hence a lot of the anti-Catherine propaganda [it's not how she died]) and into the beginning of the nineteenth. Although Russia rides on the success of 1812 (and on) for another few decades, proclaiming itself the gendarme of Europe and all that, in many ways from this point on there's perpetual decline of Russia's international position as defined militarily (a few successes notwithstanding). The first major sign of that is the Crimean War... and that brings us to the Great Reforms. One theory for why Alexander pushed through the Great Reforms is that the debacle of the Crimean War forced it upon him. And why the debacle? Too many enemies, not enough allies. Serfdom. But also, and very significantly, technological backwardness. More difficulty supplying troops over much shorter distances than enemies. Guns that don't shoot as far. Less advanced navy. I've often thought that there are interesting parallels between Russia's two wars with Napoleon and the US wars with Saddam. Two wars separated by periods of more or less liberal reform. The first a kind of half victory. The latter a rout. Images of the enemy as the antichrist (or otherwise eeeeevvviiillll). There are big problems with the analogy, of course; it's only really quite loose. But, still, there are certainly ways in which links can be made. But just recently, I started thinking about future parallels, based on the idea that just struck me about this period being in many ways the peak of Russia's international power (until 1945, really). After this Russian leaders squander many opportunities for internal reform, make bad judgments as far as foreign policy goes, and allow millions of their citizens to die from natural disasters or wars. And that's not even getting into the whole revolution and Soviet disasters and Stalin stuff. And one of the things that was an immediate problem was Russia's inability to keep up with the West technologically, which most manifested itself during the Crimean War. Although between the Napoleonic Wars Alexander I, then tsar, established new educational institutions throughout Russia, after the second war he allowed his minister of education to force them onto a much more religious path. Now, internal freedoms, or the lack thereof, certainly played just as much a role in Russia's difficulty with modernization, but educational priorities matter, too. And that brings me to the US today. And science. And its difficult position within American society, largely because it's not in American society. And that makes me sad and anxious. Yeehaw, woohoo, excellent, fantastic. They even did reasonably, in the end. But. Now I'm flitting around pulling things together to head out of town for two and a half weeks, which will include holidays, home time, time down at my old graduate school working in the library and seeing people, friend time, and an academic conference. Yipes. This is why I'm not flying out until 7:30 tonight. Despite the crazy, I have to comment on something. This morning I was listening to Morning Edition while making coffee, and heard this story about the whole NSA spying on Americans thing, and specifically on the reaction to it of members of congress. They interviewed a Republican and a Democrat, and brought up, specifically, Rockefeller's classified letter to Cheney voicing doubts about the program. The major focus of the Republican, Congressman Pete Hoekstra (MI) is basically, if you were really worried about it, why did you just write a letter? Why didn't you try harder to do something? He notes that "I've got lots of tools at my disposal to stand up for the American people" (and thus a letter to the vice president isn't enough, although he later lists going to the veep as one possible way of dealing with that whole classified thing--the other options are going to the speaker or to the president); later, he notes "members of Congress have tremendous tools at their disposal... uh... to impact the executive branch." Tremendous/significant; impact/influence. Now, I know that pointing out the uncanny ability of Republicans to stay on message and to push their talking points on every possible media outlet is oh so very Daily Show, but it just struck me enough to put it up here. Maybe it's not truly significant. But the repetition of "tools" with no real example of what those tools are other than telling someone higher up, which is exactly what Rockefeller did, is just icky. Yeah, I know you apparently don't really believe in that, or something. But still. This isn't about the home on Lake Como, though that is fairly swoonworthy in a Elizabeth Bennett sees Pemberly kind of way (there was a preview for Pride and Prejudice before the movie). Nor is it about the fact that, well, you're a damned handsome man, who seems to be managing to become more handsome with age. Good genes, there. No, it's about the fact that Good Night, and Good Luck was fan-freakin'-tastic. A lot of the reason I think that is because of what it isn't. It isn't overstuffed and overlong, in order to add superfluous melodrama. It isn't heartwarming and feel-good. It isn't self-congratulatory (mostly), nor is it an easy answer to anything. Instead, it's moving, suspenseful, funny, heartfelt, and, in the end, deeply uncomfortable. And gorgeously shot. And fantastically acted. And filled with "hey, I know him/her" people (including actors I recognized from Gilmore Girls, The OC, Homicide, and Rescue Me). And with a soundtrack filled with songs sung by Dianne Reeves, whose voice is so lovely that as I've been writing this, I've also been downloading some of her music from iTunes. And Clooney gets quite a bit of credit for this, I think. He's a smart guy, who talks about all this stuff really well; in fact, while I'm commenting on that, here are part or all of Clooney's appearances on Charlie Rose, on Fresh Air, and on The Daily Show. His appearance on The Daily Show is actually rather interesting, too. Because as I watched the movie, and watched Murrow's team going through footage of McCarthy speaking to show his hypocrisy, I couldn't help but think that the only people that seem to be doing anything at all like that right now is, well, Jon Stewart's crew. Which is kind of the point of the movie... or at least, the point that TV has acquired extra resources and extra reach (the movie even reminded us that TV wasn't always 24 hours, let alone 158 channels 24 hours), and ever less effort to do anything but pander. So, seriously, Clooney? Call me! Every morning I don't have to rush off to the office I have a little web routine. I get a paper copy of the NY Times, and read through that with my coffee. Then I go on line and check out a series of websites, including that of my local paper. This morning that action just made me disgusted with people. Not all people, obviously, but some people. A half-dozen picketers from Westboro Baptist Church of Topeka, Kan., stood outside the stake holding signs that read "Thank God for dead soldiers" and "Thank God for IEDs (improvised exploding devises)." The group also protested the funeral of Matthew Shepard in 1998, claiming Shepard deserved to die because he was gay. The right-wing group, which has picketed other military funerals, was not saying MacKenzie was gay, but that he died for America and America supports homosexuals. I mean, seriously? And on a day when another piece of news reported on Bush's speech to veterans yesterday. Again with the refusal to accept any personal responsibility for anything. Not that a lot of Democrats have done much better, because I've spent a lot of time over the last few years being pissed off at them, too.